In a secluded bay overlooking its own private sandy beach, the luxurious five star Royal Myconian Resort and Thalasso Spa is an idyllic hideaway. This authentic family-owned Greek island hotel is the perfect combination of Greek Myconian Hospitality and distinctive personalized service. It's a perfect hotel for everyone, especially those who want to share romantic getaway.. We want your travel to Mykonos Greece to be as comfortable and luxurious as possible. The Royal Myconian Resort and Thalasso Spa enjoys a privileged location on Mykonos. 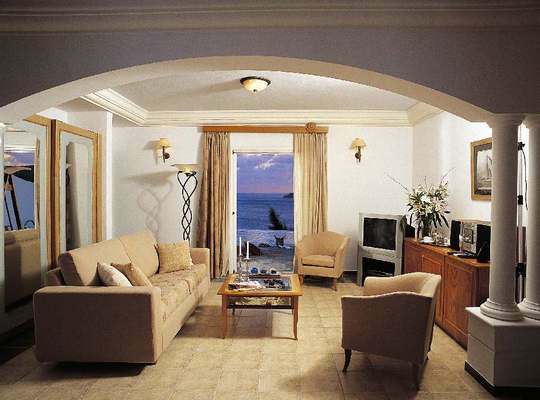 Our luxury hotel sits on a secluded bay with breathtaking views of our private Elia beach. The Royal Myconian Resort and Thalasso Spa is a member of the exclusive The Leading Hotels of the World club. Our luxury Mykonos hotel perfectly combines of Myconian hospitality and attention to detail. Enjoy an idyllic romantic holiday at The Royal Myconian Resort and Thalasso Spa. Our luxury hotel on Mykonos features a modern Thalassotherapy Spa Center, as well as indoor and outdoor pools. Our deluxe guest rooms and suites have the luxury of private pools and a private spa to ensure privacy and complete relaxation. Our luxury facilities and professional staff will help you feel perfectly at home. All our spacious Deluxe Rooms, Superior Rooms, Junior Suites and Executive Suites feature superb views of Elia beach and the Aegean Sea. In fact, you can even opt for your own private pool or your private Spa Jacuzzi. Each room is approximately 28-50 sq meters - Easy access in the resort with elevators - All have spectacular views of the Aegean sea - Fast Internet access - Hair dryer, safe and mini bar. Kids playground (not supervised) - Three swimming pools - Kids swimming pool - Water sports and padi diving center nearby. Elia Restaurant - Authentic Mediterranean cuisine - Ambrosia a la carte - Fine Dining - Meltemi Snack - Light snacks - Disco Bar - Lagoon Swim-up bar - Cocktail Bar - Pelagos Veranta Bar - Chic cocktail bar, outdoor terrace. Είστε ιδιοκτήτης ή διευθυντής στο ROYAL MYCONIAN RESORT AND THALASSO SPA; Εγγραφείτε τώρα για δωρεάν εργαλεία, που μπορείτε να χρησιμοποιήσετε για να βελτιώσετε την καταχώρησή σας και να συνδέσετε την ιστοσελίδα σας και το σύστημα κρατήσεών σας.